First of all, nobody wins when there’s a breakdown between a referring primary physician and a specialty provider. For the patient, the recommended health care is, at best, delayed. Furthermore, for the business dependant specialty practice, the doctor referral is a lost opportunity. Consequently, professional referrals are the lifeblood of specialty practices. Furthermore, with competition constantly increasing, practices require a marketing specialist devoted to referral development. In addition, the competitive colleagues in your area already have someone doing that job. Their title is physician relations, practice representative or physician liaison, and their job is new business development. As a result, a physician liaison is a skilled and experienced sales person who is directly responsible for a system for doctor referral appointments and a measurable Return-on-Investment. 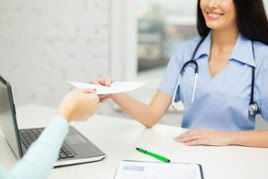 How is your doctor referral process working? Is there fallout between referral and appointment? Does the referral include good quality provider information? Can someone make an appointment in a few days? (Or is it weeks?) Most of all, we know how to build a successful referral and relationship system for your practice. Please give us a call today at 800-656-0907. Let’s talk.